Mandela Day Yoga With Yoga Works…. 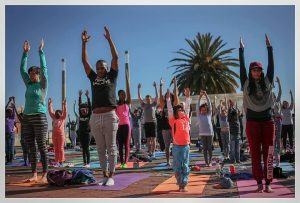 To celebrate Mandela Day, we invite everyone to get together at the historic Constitution Hill in Braamfontein and work through 27 yoga poses to honour the great courage and beauty of the late Nelson Mandela. Many of the poses remind us of the strength and compassion of Madiba: hero pose, humble warrior pose, mountain pose, fierce pose and many more. This event supports the neighbouring organisation Lefika La Phodiso – Community Art Counselling and training Institute. They use art counselling to help youth affected by traumatic experiences. We are inviting 50 of their young clients to participate in the event. The yoga session is R120 per person, and you can choose to sponsor a local Lefika child for R60. Should you wish to go on a guided tour of the venue (Walk with Madiba), it is an additional R100. Collection Drive: bring any clothes, blankets, books, toys which you no longer need and donate them to our local charity. Proceeds of the event will be shared with Lefika La Phodiso Institute.